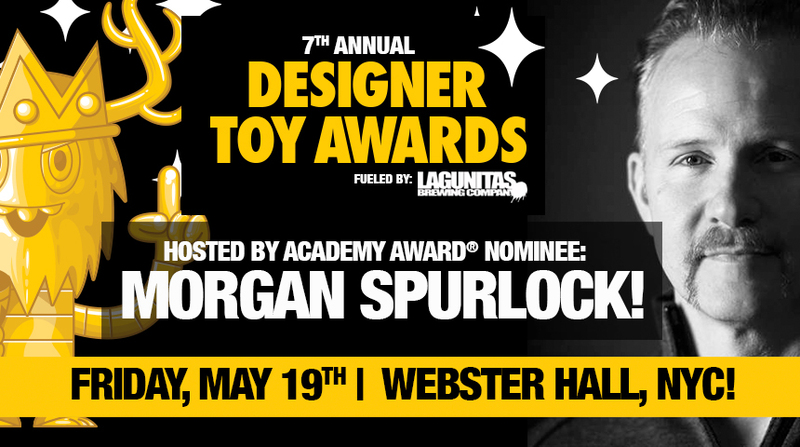 Not only that, we are also excited to announce a new venue for the annual ceremony - Webster Hall (125 E 11th Street)! This year's awards ceremony is being held on Friday, May 19th, kicking off the inaugural Five Points Festival, a toy and comic art convention curated by Clutter Magazine! Taking over Pier 36 on Manhattan’s Lower East Side on May 20th & 21st. Went to attend the Ceremony?!? Fans looking to mingle with designer toy industry luminaries will have access to the award ceremony with the purchase of a Five Points Festival VIP Weekend Ticket. In addition to attending one of the best parties in the East Village, VIP Weekend Ticket holders will be able to experience the Five Points Festival’s dynamic lineup of counterculture artists from around the world, gourmet food trucks, and craft beer. Fans will be able to engage and catch up with past DTA winners and further toy and comic artisans at Five Points Festival including Amanda Louise Spayd, Bryan Lee O’Malley, Chris Ryniak, Cliff Chiang, Gary Ham, Huck Gee, Jamal Igle, Jason Freeny, Khary Randolph, Mags Visaggio, Ron English, Tara McPherson, Sean Gordon Murphy, and Simone Legno.